Book one of theNew York Times-bestselling All Souls trilogy"e;a wonderfully imaginative grown-up fantasy with all the magic ofHarry PotterandTwilight' (People). Now ';[a] hot show that's likeTwilightmeetsOutlander' (Thrillist)airing Sundays on AMC and BBC America, as well as streaming on Sundance Now and Shudder. 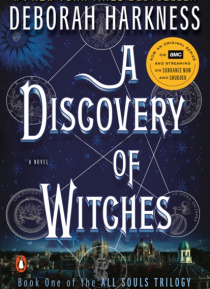 Deborah Harkness's sparkling debut, A Discovery of Witches, has brought her into… the spotlight and galvanized fans around the world. In this tale of passion and obsession, Diana Bishop, a young scholar and a descendant of witches, discovers a long-lost and enchanted alchemical manuscript, Ashmole 782, deep in Oxford's Bodleian Library. Its reappearance summons a fantastical underworld, which she navigates with her leading man, vampire geneticist Matthew Clairmont. Harkness has created a universe to rival those of Anne Rice, Diana Gabaldon, and Elizabeth Kostova, and she adds a scholar's depth to this riveting tale of magic and suspense. The story continues in book two, Shadow of Night, and concludes with The Book of Life.